Granola is a popular breakfast cereal in the US which is catching on fast over here. Well known brands are producing their own versions of this oat-based cereal, but they come at a high price – calories and sugar! Lizi's Granola cereal range is a bit different. They're not only lower in sugar than many other granolas, they've been scientifically tested so they can be called a low GL product. And even better, they're totally delicious. Granola is made predominantly from oats and is usually sweetened with refined sugar and/or honey. Many varieties also have added dried fruit. All these combined mean that granolas can be very high in sugar - something which more of us nowadays are trying to cut down on. I’ve been following the low GL (glycaemic load) diet as much as possible during the last few months. Basically this means cutting out all forms of added sugar and greatly reducing anything containing sugar as well as refined foods like white bread, rice etc. It’s not as easy as you might think. Sugar is in so much processed food, and I’m quite shocked at how much is in some ‘diet’ yogurts despite them being low in calories. 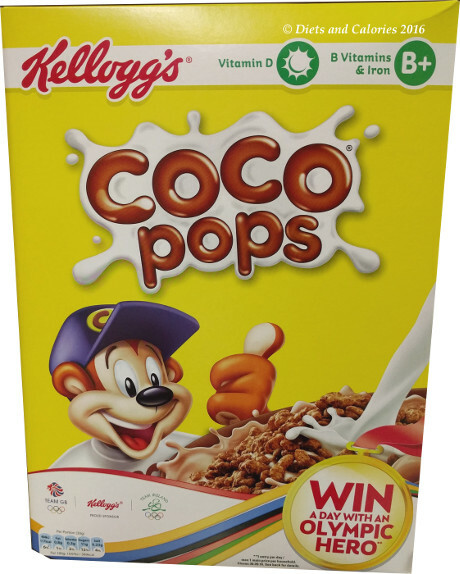 One food I steer well clear of are sugary breakfast cereals, especially those called Granola. Much as I love the taste of this stuff, the sugar levels are frighteningly high and of course, so are the calories. 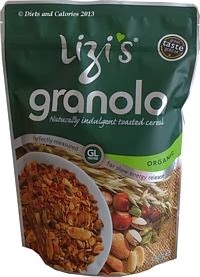 Funnily enough, Lizi’s Granola is made by a lady named Lizi, who has been making granola for many years. I suspect she has a few helpers these days. Over the years she has refined her granola to become low GL by not including any dried fruit or added refined sugars. Instead she adds healthy nuts along with the oats and sweetens them with either agave syrup, black treacle, apple juice or oligofructose (derived from chicory). 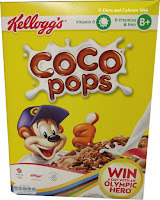 And depending on which variety you buy, certain other ingredients too, like coconut. 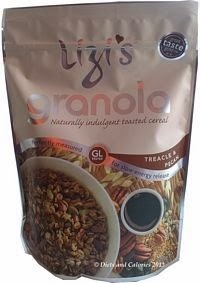 Lizi’s granola selections include: Original, Organic, Treacle & Pecan, Pink Apple & Cinnamon or Belgian Chocolate. 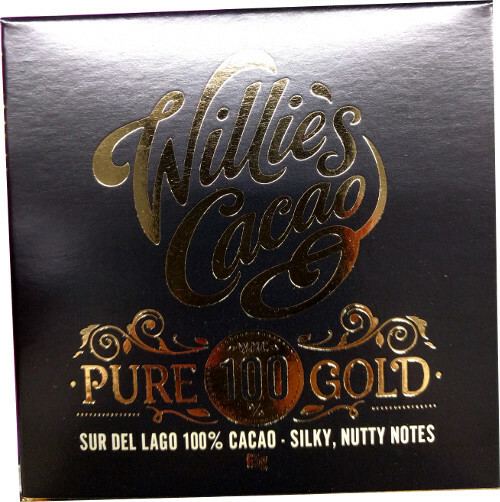 So far I’ve bought the Organic, Original and Treacle & Pecan which are available in 400g or 500g resealable bags. I must admit I was put off by the cost. Yes, they are pricey – the Original costs £3.69 for a 500g bag in Sainsbury’s, but in my view, totally worth it. In fact, my biggest complaint about Lizi’s granola is that it’s just too delicious. Unlike many other granolas, Lizi’s is made up of very small pieces, so you don’t get any of those enormous clumped together lumps. It’s too easy to end up crunching on a few of those large clumps and end up swallowing 100 or 200 odd calories without noticing. Lizi’s granolas are sweet and very crunchy, with the underlying flavours easy to pick out. I prefer eating it as a snack on its own or as a crunchy topping for desserts. Using it this way I find a bag lasts a long time. 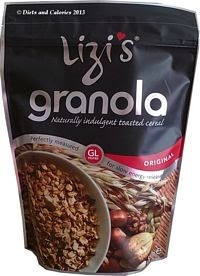 As for calories, yes, Lizi’s granolas are still high in calories with the organic variety having 494 calories per 100g. The recommended serving size is 50g, but because it’s quite heavy it doesn’t look like a whole lot. Just remember to go easy on the portions with granola! And if you're unsure how much 50g is, weigh it out first so you know for next time. It is high in fat, but they’re ‘healthy’ fats from the seeds and nuts as well as the oil and the fat found naturally in oats. Available in health food shops and some supermarkets.